• 2004 Bank of America haunting him with absurd covenants. While research for new refinancing started promptly, too many people were involved proposing any kind of trick. Stabler talked with Branca and Koppelman and Fortress out of no where purchased his loan from Bank of America. • 2005 The loan’s matured. Fortress granting 3 extensions too short and too expensive (3 million each time) not giving the suitable time to put in place new refinancing documentation. Branca filed a UCC1 on MJ Trusts. • 2006: Five banks answered Michael Jackson bid for refinancing however Fortress, which was not even a bank but hedging fund, “found” foreign currency to finance MJ debt and keept him tied with another over collaterized investment, where all his assets were pledged again. Branca payment meant another pledge over Neverland. Branca liens still delays the loans disbursement to the extent that Bank of America almost open the liquidation procedure. Once Branca is finally paid off, it jumps out another potential impediment with the Prescient lawsuit. ALL THIS WHILE MICHAEL JACKSON WAS SPENDING HIS DAYS BEFORE A JURY THAT HAD TO DECIDE HOW HE WOULD HAVE PASS THE NEXT 30 YEARS OF HIS LIFE IF HE WAS FOUND GUILTY. Some entity behind the scene created these events to make him has fail. And he knew, he told us! 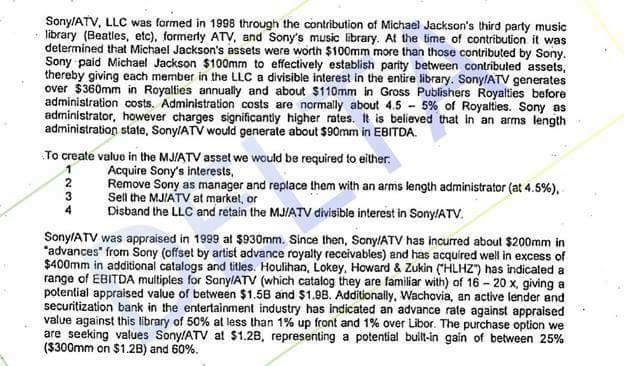 Before we go any further with the odyssey of the Michael Jackson refinancing of Bank of America it must be clear that MJ wanted to have the 100% shares of Sony/ATV all for himself. In fact the only document he signed personally through this whole ugly Prescient story, is a non binding letter for the study and the evaluation of the acquisition of Sony’s 50% shares in Sony/ATV. If you have read the first part of the blog, http://marcoballetta.com/going-back-to-the-root-of-michael-jackson-financial-problems/ you already realized that Stabler contacted anyone whom potentially could have given him a hefty percentage. Darien Dash, owner of Prescient, connected with Transitional, a company affiliated to Fortress and in December 2004 they submitted a refinancing project which included the acquisition of 50% shares of Sony Corp in Sony/ATV. In fact with the tenth anniversary of company incorporation an article of the operating agreement of the company included a buy/sell provision. Both members were subject to the buy/sell agreement. There were many reasons why MJ wanted to purchase and get rid of Sony as business partner also with Sony ATV and Transitional presentation explain them clearly. Unfortunately due to the difficult interpretation of the trigger clause values, the trial and the obstructionist power games behind the scenes, this project did not go into fruition. In January 2005 Transitional jointly with Fortress issued a LOI (letter of intent) to refinance and restructure the BOA loans. Shortly thereafter, Fortress issued a letter of commitment to the *Jackson Entities committing to fund 330 million so that the BOA Debt could be ” taken out,” removing BOA as lender and have some working capital for MJ. Transitional presented a formal memorandum related to the transaction. There were some early advance agreements between Fortress and the MJ . And at the beginning of April 2005 Fortress issued another commitment (a bridge loan) letter to provide to MJ entities a credit facility of 92 million to refinance the BOA credit line (MIJAC and Neverland). The April Fortress Commitment contained a reference to the obligation of MJ and MJPT to pay a 9% break-up (2% break-up fee to be paid to Fortress and a 7% BREAK-UP FEE TO BE PAID TO PRESCIENT AG, AS MJ ADVISORS). Around mid april MJ understood that things were messy and asked the help of Jessie Jackson, Ron Burkle and Yucaipa Companies. During the course of the deal structuring and additional discussions between the Jackson Entities, Fortress and BOA, Fortress learned that the Jackson Entities were obligated to pay a 9% fee to Prescient for its role as counsel and exclusive financing agent. (We know they did not have exclusivity for the deal, there were Goldman Sachs, GE Capital and Cin Ven deals still pending). As soon as Yucaipa (Burkle with Jesse Jackson) became officially Michael Jackson’s advisors, Fortress ( do not forget Mr Rob Wiesenthal, Sony Financial guy was directing Fortress moves) circumvented the Prescient/Transitional agreement and contacted BOA directly. As a result of that, in May 2005 Fortress negotiated various assignments and assumption agreements with them so that Fortress would take an assignment of the BOA Loans. There is only one particular note: while negotiating with BOA, Fortress, who was already involved with MJ refinancing, FORGOT to tell to his potential new client (MJ Entities), about the negotiation they were opening – and then closed – with BOA. One of Fortress Directors, Constantine Dakolias said they had to sign a no disclosure agreement with BOA but as you can read in the excerpt of his deposition, lawyers dealing with the case did not appreciate the move and the lack of transparency (Especially after being aware about the too many meeting with Sony in Sony offices with legions of lawyers going up and down clocking out their presence unvoiced to MJ directly). In the First Forbearance Agreement letter dated December 20, 2005 Fortress agreed to forebear through and including January 16, 2006. In exchange MJ Trusts had to pay to Fortress an amount equal to one percent (1%) of the outstanding balance of the BOA Loans. The First Forbearance Agreement also provided that Fortress would have a right of last offer with respect to any proposed refinancing. The Put Extension agreement of the Sony/ATV operating agreement gave them the Right of Last Offer. Another forbearance was negotiated in January 13, 2006 and extended to February 18, 2006, and it amended and restated the First Put Extension Agreement to extend the term of the MJ put through May first, 2006. In addition, the First Forbearance Agreement provided Fortress with a right of last offer to match any bona fide written offer, received by the Jackson Entities on or prior to the expiration of the forbearance period, to effect a refinancing with respect to the approximately 275 million dollars now owed to Fortress. The short terms forbearance period offered by Fortress was insufficient for the Jackson Entities to cure the default under the terms of the existing BOA loan agreements and to top it off Sony – behind the scene was pushing Bank of America to open the assets liquidation procedure. As such, the Jackson Entities invited bids from various financial institutions to refinance the existing loan facilities. In response, the Jackson Entities received 5 proposals such Cerberus, Cheyne Capital, Citigroup Global Market, Fortress and Goldman Sachs. It is noteworthy that each time a forbearance was entered into, Fortress assessed additional fees against the Jackson Entities, including without limitation, a 1% forbearance fee of 3 million. Not willing to allow this lucrative and over-collateralized deal to sneak away, Fortress exercised its right of last offer about February 14, 2006. Thereafter, Fortress, the Jackson Entities (and Sony) began negotiating the deal documents for a 300 Million Dollar refinancing. However, due to a number of complex open matters, including the issue of creditors indemnification, the closing date was adjourned until April 13, 2006. Branca UCCs created an impediment to Fortress refinancing. On September 27, 2005 John Branca, former attorney of MJ, filed UCC Financing Statements against the MJ Trusts, claiming an interest in MJ-ATV’s assets. Settling Branca claim was an important precondition for the closing of the 300 Million refinance because it directly affected the collaterals being used as security. The Jackson Entities submitted to Fortress the Neverland Valley Ranch as collateral to pay off Branca, being the asset fully owned by MJ and free of any pledge. Fortress (through one of its subsidiaries or affiliates, DBCG LLC) agreed to finance additional 20 Million Dollars secured by Neverland. 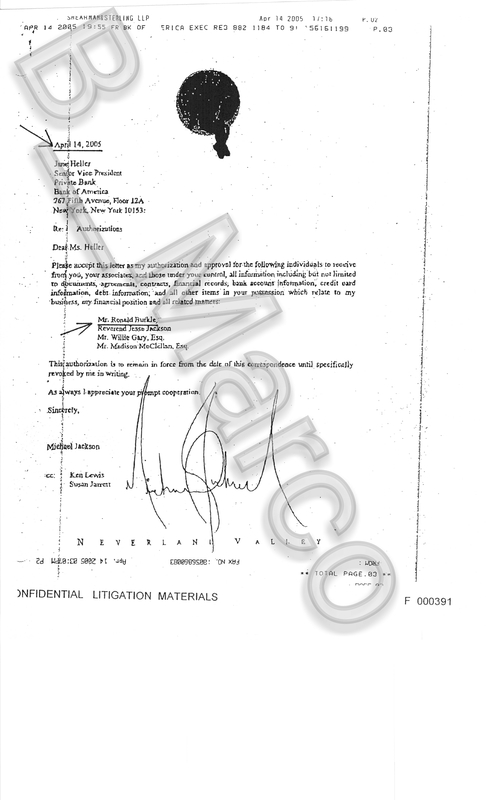 The purpose of the Neverland Loan was to provide MJ with sufficient cash to pay off the Branca Claim. 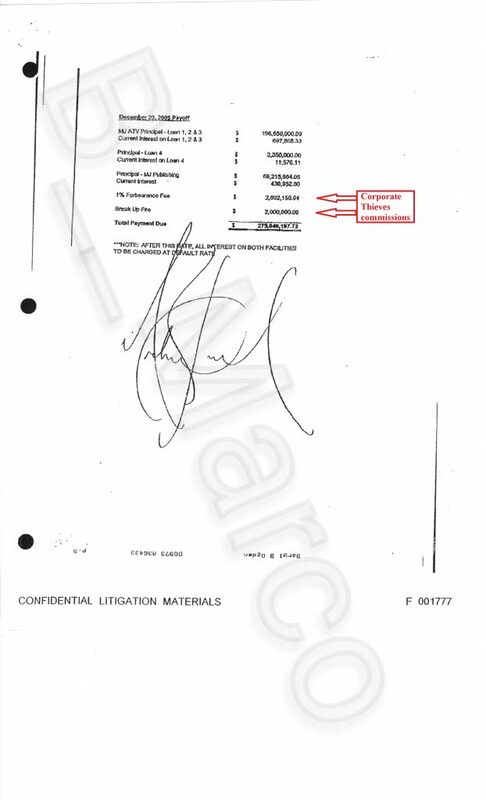 (Neverland Ranch loan dated March 31, 2006). 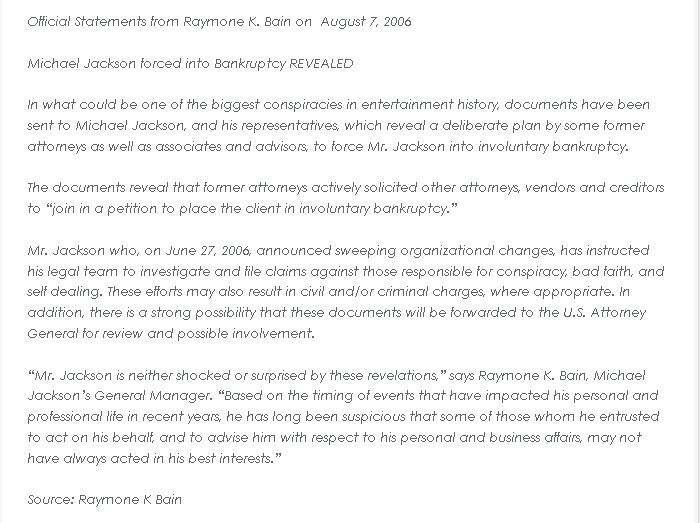 Branca made an UCC1 financial statement against MJ assets, claiming interests in MJ/ATV (trust owner of MJ Sony/ATV shares) when actually he was “still” (he was supposed to have resigned in 2003 as Myung-Ho Lee and Barry Siegel did) a MJPT trustee and his interests were limited in billing his supposed legal advises as per an old agency contract related the administration of few songs belonging to MIJAC library and distributed by Sony. Branca paid off happened on April 13, 2006 for the sum of $13.5 Million Dollars. Millions down the drain, but so it was Michael Jackson who paid!! In an ordinary situation MJ could have taken legal action against Branca and his assertions, and easily exposed his fraudulent claims. But there was no time, the loans were on the expiration date and urged to be refinanced. Branca carried out this action in order to block the refinancing. In fact he knew that creating a “liens” over the MJ/ATV asset would have stopped the disbursement of the funds by the new financial institution, as long as the debts were not cleared. And this delay put in place would have caused a possible opening of the bankruptcy proceeding that Sony was looking for, and the relevant MJ bankruptcy due to the fact that BOA, in addition to his musical assets and Neverland, had also a Michael Jackson personal guarantee. As soon as Branca was paid off the Prescient lawsuit started, and after a few discussions it was clear that it did not affect Fortress refinancing, not being an effective liens on the assets but just one of countless requests for money from the tribe of leaches living off Michael Jackson’s genius. Even with the most negative karma of the planet, all of this cannot happen and at 360 degrees like it happened to Michael Jackson. It was not an accident, it was not casualty. This is all so disgusting. These crooks need to be prosecuted and held accountable. I don’t see that happening. It seems EVIL always wins. It breaks my heart all these monsters went after MJ. He deserved to be treated like the kind hearted genius he truly was. I’ve watched MJ since the Jackson 5 days and will keep him in my heart. I will never buy anything post 2009 I feel this would be a betrayal to MJ and everything he worked so hard to get.